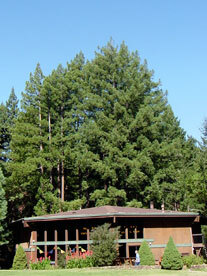 Redwood is a warm and hospitable place where guests are able to ease out of the rigors of daily life. Our rooms and accommodations are simple and well-appointed, free of distractions and clutter. Each year, we serve up to 200 Christian groups and churches ranging in size from 10 to 425. Guests will enjoy the warmth of our staff and our desire to earnestly serve from beginning to end. For those who like a little more action, we offer equipment and courts for basketball, volleyball, Frisbee golf, horseshoes, ping-pong, badminton, shuffleboard, soccer, football and softball. We also have two children’s playgrounds and a full nursery for toddlers and infants. Our heated swimming pool is available seasonally, complete with a fantastic children’s area. For those who like to shop, the Redwood Gift and BookShop is also a delightful destination. Santa Cruz County is a very popular tourist area, chalk full of activities and options that are sure to please. Click HERE to find out more about our geographical location.